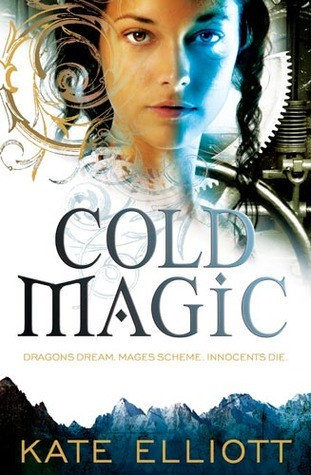 Cold Magic is, by the author’s description, “an Afro-Celtic post-Roman icepunk Regency novel with airships, Phoenician spies, and the intelligent descendants of troodons”. Catherine Hassi Barahal is an orphan raised by her aunt and uncle, besties with her cousin Beatrice. They live in what is geographically England, except that the Ice Age never fully ended, so it’s still connected by marshy land to the Continent. It’s also super-racially-blended, with bloodlines from Celts and Romans and Africans all mixing together in a complex and interweaving social hierarchy. Cat and Bee are enrolled in college amid a growing conflict between the mages who seem to run Europe and the revolutionary faction that seeks to supplant magic with steam technology. What kind of magic? Well, lots of kinds. There’s cold magic and fire magic and druids and bards and other things. There might be the Fae, by way of seelie and unseelie courts, but their existence is unproven. Cat has a mysterious sort of magic which gives her super-hearing, a certain level of invisibility, and other abilities that reveal themselves through the course of the book. So does Beatrice. Oh and there are “trolls”, who come from North America and have evolved to intelligence and culture. The plot initially looks like it’s going to explore Cat and Beatrice’s lives inside this construct, but then it takes a hard left turn when a cold mage turns up at the Barahal household claiming the eldest daughter as his bride, and Cat gets shoved at him with literally no explanation. The rest of the book is Cat having no more idea than the reader what the hell is going on. It has something to do with her family, who may or may not have been spies two thousand years ago, or twenty years ago, or now. It has something to do with her magic, and something to do with her cousin’s. It has something to do with the escape of a Napolean-figure who’s actually from Spain who tried to conquer Europe a few years earlier. It has something to do with sabertooth tigers. It has something to do with airships. The one thing really driving the plot is that Cat has to get back to Bee before the winter solstice so that the cold mages don’t claim her instead. That feeling you’re having right now, trying to make sense of that summary? Is what the entire book feels like. I very much wanted to like this book. I read it on recommendation from a good friend whose taste I trust, and it has a lot of elements that were enticing to me. But the execution was… not what I had hoped. The result of Elliott throwing all of those aforementioned genres in a blender isn’t a well-processed smoothie — it’s a chunky, uneven mess. I spent the entire book trying to figure out if my reading comprehension had suddenly taken a leave of absence, or if the book was really just that confusingly written. Since I’m reasonably certain I’m still in possession of all the wits I started last week with, I have to assume it’s the latter. What’s so frustrating is that there are a lot of good ideas here. (The three stars I’m giving this book come a lot from just the sheer credit of that). The Afro-Celtic angle? Awesome. I love the route that alternate history has taken here, with Rome and Carthage fighting to a standstill rather than going the Carthago delenda est road. I love the idea that the Mali Empire had a diaspora that caused Africa to colonize Europe, rather than the other way around. The blending of cultures has so much potential, and the fantasy and sci-fi genres in general could do with a lot more of that. I also love the idea of magic and science engaging in a horrible struggle for dominance, and the political and social consequences for each side are such fruitful avenues for exploration. But somehow, all of these elements just totally failed to synthesize — and I rather suspect at least part of the problem is that Elliott tried to do too many things in the same novel. The dinosaur-descendants, for example — a fascinating concept, but thrown into this novel, it’s definitely just one tangent too many. The Regency era angle is underused to the point where it may as well not exist (to anyone wondering why it’s called Regency if the year is supposedly 1837, they’re counting in “Augustan Years”, and he became emperor in 27 BCE — so the equivalent year is really 1810, not 1837. Not that you would know that from reading the book, since Elliott never explains it). The blending of cultures, while super-intriguing, is also poorly explored — it’s hard to get a clear idea of exactly what melded where and with whom and so forth. The world clearly has a shape, but the reader never gets to grasp what it is. There’s also the problem I have with A Song of Ice and Fire, which is that cultural identities wouldn’t stay the same for 2000 years no matter where you are, particularly with the amount of blending that’s apparently gone on — and family identities certainly don’t, so the idea that the Barahals have a reputation that stretches back two millennia stretches credulity. And I also think a lot of the problem is the first-person narration. Cold Magic does a great job of exemplifying what I find so frustrating about that style — it stymies the author’s ability to explain things. Throughout the book, you get the sense that there’s a lot Cat knows which the reader doesn’t and which she doesn’t bother to explain, a lot of “given circumstances” that you just can’t allow to lie there as assumptions in an alternate history. But at the same time, the first-person narration means that the reader also can’t know anything that Cat doesn’t — and as the plot progresses through the never-unpacked mysteries, that starts to encompass a lot of salient details. I don’t mind the tangents that Cat goes down — The rules of magic are never explained, which in a fantasy novel I just find extraordinarily maddening. It’s several hundred pages in before anything gets explained about the cold mages, and even then, we don’t get a lot. And for all that we get a lot of history about things that happened two thousand years ago, we get a lot less on the recent history that has shaped the culture in which Cat lives — or even the current circumstances. But what’s so weird is that, while leaving all of that unexplained, Elliott devotes a lot of time to repeating things that the reader already does know, but without giving them any new depth or revelations. She also spends a lot of time talking about what the food is like at inns. I love tangents, I really do. I’m the child who read the encyclopedia for fun, so I will never fault an author for wandering down world-building avenues, even if it is a bit at the expense of the plot. I don’t mind it. But the digressions in this book are just strange. Quite often, they don’t add anything to the plot and they don’t clarify the world-building. They’re either just dull (I hate reading about food) or they only add more confusion (ghost plagues in Africa! a secret codebook! other things!). I was warned that the book might feel slow, but that definitely isn’t the word I’d use to describe it. I would go with “jerky”. The book jumps between tones so often that the reader’s likely to get whiplash. The first eighty pages aren’t slow, it’s just that you think you’re reading one kind of story, and then it suddenly becomes something completely different — which would not in of itself be a bad thing if that didn’t keep happening. You never spend enough time in any one mode to feel comfortable there before you get yanked out of it and plunged into something else, with very little sinew to connect the different ideas together. This, more than anything else, is why I was questioning my ability to process written information while reading this book, and I must say I’m gratified to see from reviews that other readers had a similar experience. Another unfortunate thing is that I quite liked several of the characters (and they account for the remainder of the 3 stars this book gets), but, either as a consequence of the chaotic writing or of the unreliable first person narration or both, we never get a clear view of them, either. Cat herself would be interesting if her head was a more coherent place in which to spend 500 pages. She’s clearly smart, thinks on her feet, and has a backbone, but is also impulsive and a little hot-tempered, all qualities I like in a heroine, and then she gets dragged headfirst into a swirling identity crisis, which makes for good internal drama. But once again, that jerky, jarring quality of the narrative makes it difficult to feel comfortable living in her point of view. Cat’s forced-husband, Andrevai, would be such an intriguing person to know better, caught between two worlds as he is, overcompensating for insecurities, experiencing an identity crisis every bit as tormenting as Cat’s — but since Cat doesn’t, the reader doesn’t get to, and the weird semi-romance that’s going on there just ends up feeling awkward and artificial. Bee is charming and a lovely subversion of expectations. And then there’s Roderic, and I won’t explain who he is because it’s a definite spoiler, but he’s just plain delightful, and I want to know him and his entire family better. Many of the side characters are interesting, too — and so many of them are female! And female characters in positions of power! That’s exciting and commendable. I just… wish we actually got to know any of them. I think I’m going to have to read the rest of the series, mostly in a hope that there are explanations occurring somewhere, and if there are, it will drive me up the wall not to have them. I can tell that, at least in the author’s head, this is a fully-realized and complete world with a lot of nuance and underlying complexities, and I trust that it all makes sense somehow. But if and when I do pick up the next book, it will be with the fervent hope that the writing is a lot more coherent than it was in Cold Fire.